Mazda Raceway at Laguna Seca each year has a featured marque with a strong racing history as a centerpiece of the Rolex Monterey Motorsports Reunion. The Chevrolet Corvette celebrated their 40th & 50th year in production here with parade laps of continuous Corvettes that completely encircled this 21/4 mile racetrack. Ferrari & Porsche had similar large turnouts for their banner years. BMW celebrated 100 years in 2016 and the company was celebrating that achievement globally. BMW erected a 15,000 square foot tent with redwood flooring and pit stalls lining both sides to celebrate this centennial. They had brought successful BMW race cars from all over the world and parked them in those pit stalls. This racetrack the place where performance is discussed and high performance is demonstrated. The other venues in Monterey only offer static displays or a simple parade. 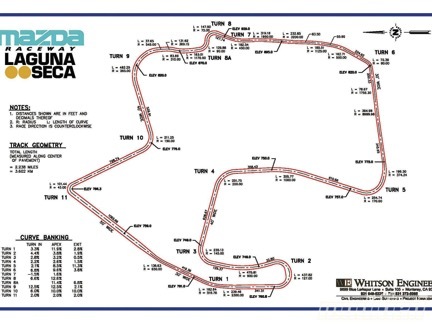 Laguna Seca is where the rubber meets the road and racing happens. Timing is everything, I happen to come over the ridge to the bridge to the Paddock Area Just as the Trans AMs were pulling out of the pits going up the hill to turn 1. Such a solid sound bouncing off the hills. There were two 1936 BMW 328s in the far corner of the tent caught my eye. 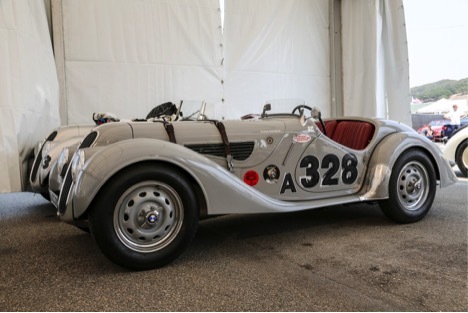 The BMW Mille Miglia 2 liter, 6 cylinder, 4 speed roadster weighs in at about 1600 lbs., makes 120 horsepower in certain racing versions, and revs to 6000 rpm. Rudolf Schleicher designed the engine with semi-hemispherical heads that provides superior torque over a wide RPM range. This is quite remarkable for 1936, since this style engine became the legacy design for BMW through the ensuing years. The 328 won it’s class in the first outing at Eifelrennen at the Nurburgring driven by Ernst Henne. The 328s went on to win their class at Mille Miglia, 24 Hours of LeMans, and the 24 Hours of Spa. I got talking with Pieter Jaeger of Muenchen, Germany. He is the owner/driver of the silver 1937 BMW race #328A. 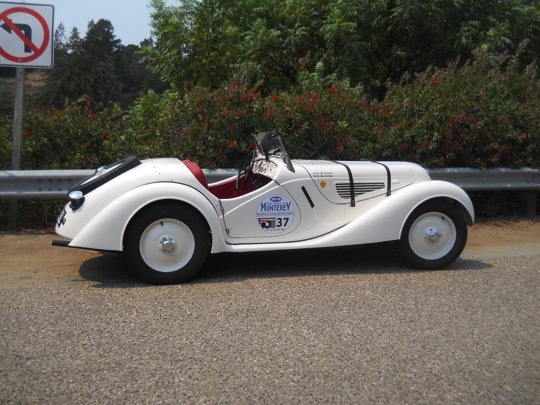 He reports that this car is very easy to drive every day, quite responsive with light steering and a joy to race. 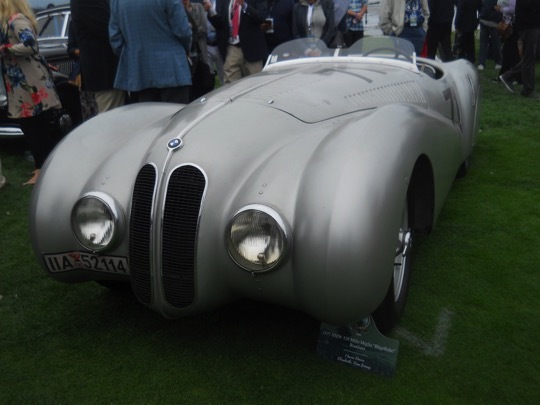 The BMW 328 is arguably one of the most successful sports cars of the 30s.The 328 was the first BMW to exhibit the twin vertical oval grille that continues to identify the BMW brand today. Style combined with lightweight, balanced weight distribution, good dependable power, and agile handling made a world winning car. A 15 lbs. to 1 hp. made it a strong performer for that time. Such an understated Champion that BMW never seemed to brag about it. So today we and BMW celebrate this car 80 years later at Laguna Seca. This 328 made the tour that started near Seattle and ended at Pebble Beach. Laguna Seca provided the opportunity to picnic with David Hobbs and Jackie Stewart in the Paddock area next to the BMW tent on Saturday at 1:00 pm. These two motor sport racing legends went on for a full hour with fascinating fast paced conversations about their racing experiences. Brian Redman at one time had told David Hobbs, “If you are not crashing, you are not driving fast enough”. Jackie Stewart told a story about travelling through Europe with Jim Clark, the reigning world Formula 1 racing Champion at that time. They were in rooms next door to one another and could hear one another through the walls. Jackie’s team manager and promoter had brought some newspaper people together for a publicity effort and had gathered out in the hallway. He asked Jackie to put on a wreath and hold the winners’ cup from the Formula 1 race that was to take place the next day. Jackie had initially refused saying that maybe they should be talking with Jim Clark the Champion instead. With the promoter insistence Jackie came out but was trying to coordinate the effort to a time when Jim Clark was in the shower. However Jim Clark noticed the flashes of the camera through the cracks in the door and came out to see Jackie Stewart adorned in the wreath and holding the Formula 1 Winners Cup for the race the next day. Turns out Jackie Stewart won that race. David Hobbs and Jackie Stewart agreed that the U.S. would need a Formula 1 Champion driver before it would become interested in the sport. They have both continuously campaigned for additional safety at the tracks. There were only 464 of these pre-war sports cars. Most of them had an 80 bhp, 1,971cc overhead-valve inline six-cylinder engine with three Solex carburetors, independent front suspension with wishbones and transverse leaf springs, rigid rear axle with semi-elliptical leaf springs, four-speed manual gearbox, and four-wheel drum brakes. 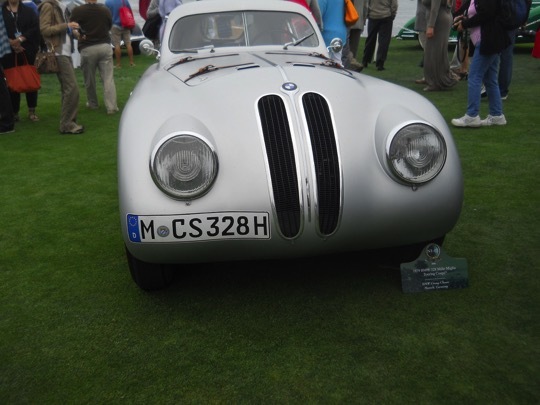 The BMW 328 ran up a record of racing victories that established BMW’s reputation for motorsports. Now, more than 75 years later, it is the most important and most collectible of the pre-war BMWs. 328s on the 18th fairway at Pebble Beach on Sunday. A 1939 Mille Miglia Touring Coupe from the BMW Group, Munich, Germany.